Playtech has done it again with their amazing slot games. The Fantastic Four slot game features great chances for huge payouts with the multiple wild bonuses and free spins galore. The game is an authentically reproduced experience that has been endorsed by Marvel Comics. Underneath the genuine Fantastic Four logo are five reels that are beautiful to look at. The clear and beautifully rendered sound effects make game play even more enjoyable. Reels are animated and colorful to enhance the visual element. All of the most popular and loved characters are represented including The Thing, Mr. Fantastic, The Human Torch and The Invisible Woman. The graphics jump and move while you play the game. All four Fantastic Four heroes have an animation that shows off their amazing super powers. • The Thing – Flexing and punching left and right. • Mr. Fantastic – Stretches as tall as a skyscraper. • The Human Torch – Sets himself on fire and runs off. • The Invisible Woman – Disappears and leaves behind a bright flash of lightning. In addition, the symbol for wild cards is the Fantastic Four logo. The Earth represents the scatter symbol and an animated Silver Surfer comes to life when you hit it to award the free games. Cards that are high value are also represented by metallic symbols. You can bet on up to 20 lines and the maximum bet per line is 10. The progressive jackpot can be won after it is triggered by matching 3 like symbols that will give the player a certain jackpot amount. 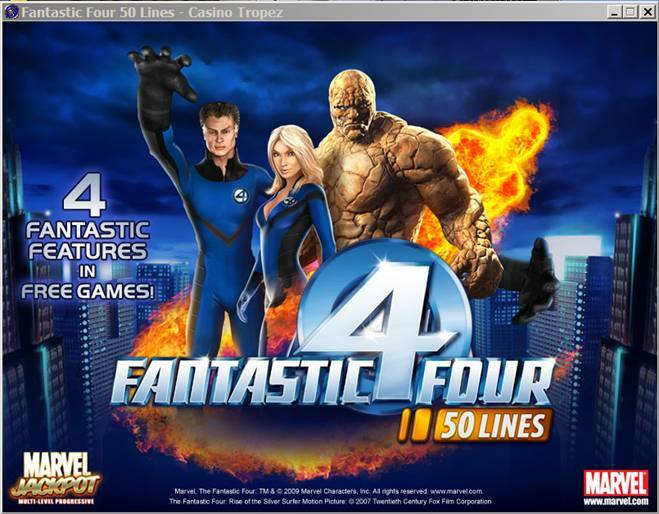 The Fantastic Four slot game has two bonus features: The wild cards and the scatter cards. These cards are always beneficial and give you even more ways to win. Get up to five scatter symbols to increase your winnings by up to 10,000 times. • The Thing – a full reel gives the player 3 free spins and he will freeze a reel. • Mr. Fantastic – a full reel gives the player 4 free spins and an expanding wild. • The Human Torch – get this for 4 additional spins, super wilds and expanding wilds. • The Invisible Woman – 4 more spins and a bonus multiplier every time she appears on the reels. Marvel has created the progressive jackpots to span across many different Marvel slot games, so the jackpots can be huge when triggered. It is a great gaming experience!